Lineup construction is a topic that comes up far more often in proportion to how important it is. But if you can save a few runs in a year by using the proper lineup, it’s worth it. Put your OBP up top, not your steals. The #2 hitter should be better than your #3. Not everyone has caught on; either Dusty Baker or Ben Revere really need to figure things out soon for the Nationals, for example. 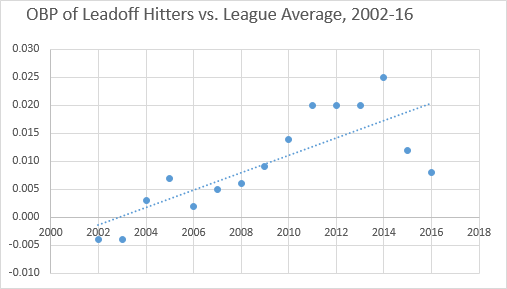 But leadoff hitters are getting better at getting on base. But next time you lament the general failures of managers to put out the correct lineup, remember, things are getting better. Maybe it’s just your favorite team’s manager. We hoped you liked reading Lineup Construction is Changing by hscer! hscer (pronounced h-s-seer) is also the Curator of MLB quizzes at Sporcle.com. You can join Dan Szymborski in following hscer on Twitter. “Right field hitter” is interesting. 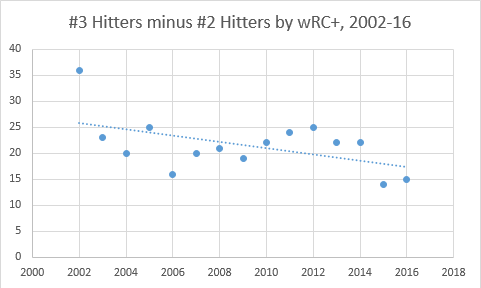 Is there any consideration to having a guy who is a strong pull lefty or a “hit away” righty that will increase the chances of a runner on first going to third? w/r/t the Jays, I believe Donaldson, Bautista and Tulowitzki have all batted 2nd at times this year.